We’re building almost anything and everything. 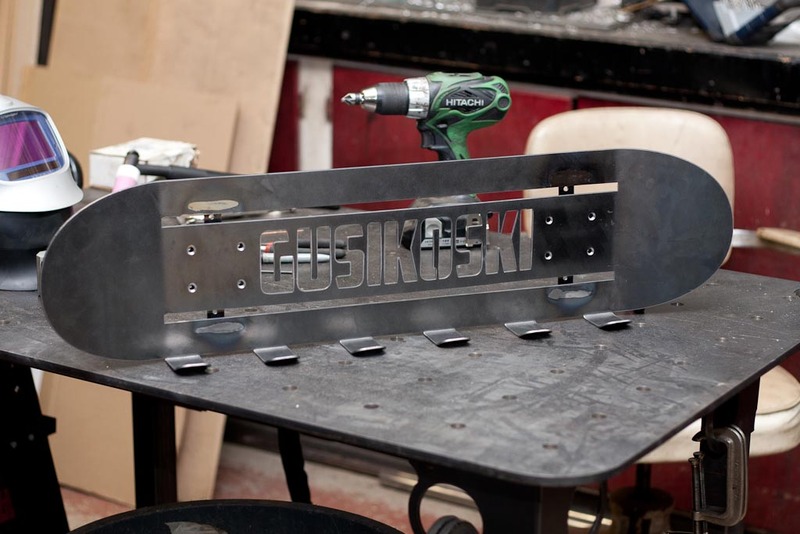 This time we’re working on a custom built roof rack. We had completed the design work for this roof rack a few weeks ago, it was a collaborative project with the customer as he had quite a few requirements. Once all the requirements were listed a 3D model and subsequent drawing was created, the drawing was reviewed and the build process began. The advantage of designing it is that we could figure out the actual mass, in this case 47.55lbs (not factoring in the weight of welding filler). 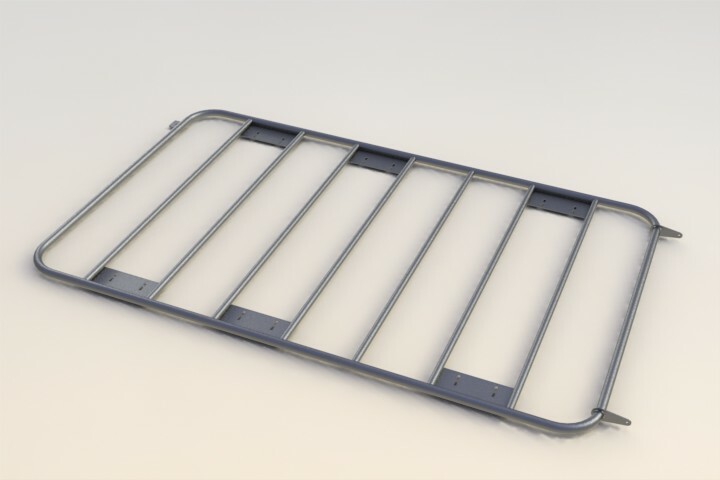 The rack uses a Ø1-1/4″ perimeter hoop and seven Ø1″ horizontal crossbars. 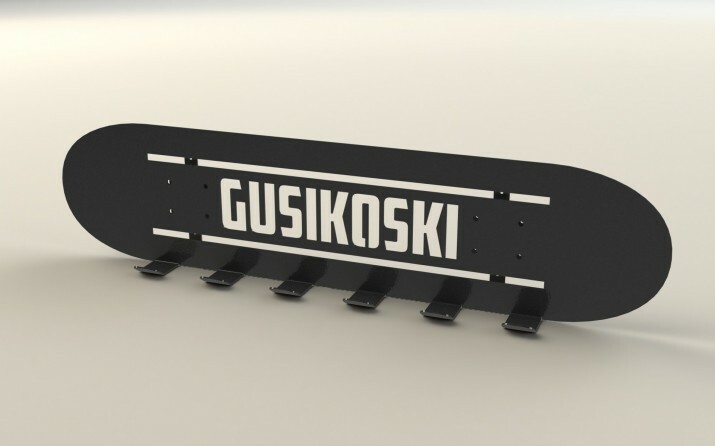 Here’s the 3D rendering of the roof rack. The tab at the rear is for an LED powered flood light, the two tabs at the front are for a LED light bar. All the plate pieces were cut on the CNC table and prepped for welding to the rack. 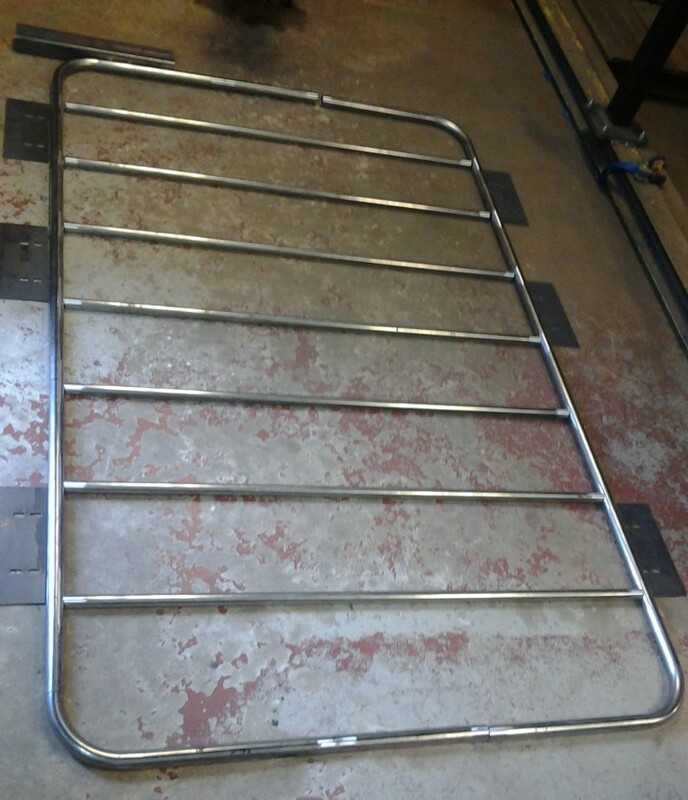 Here are the pieces laid out on the shop floor prior to tacking and welding the main hoop and the coped Ø1″ tubes. 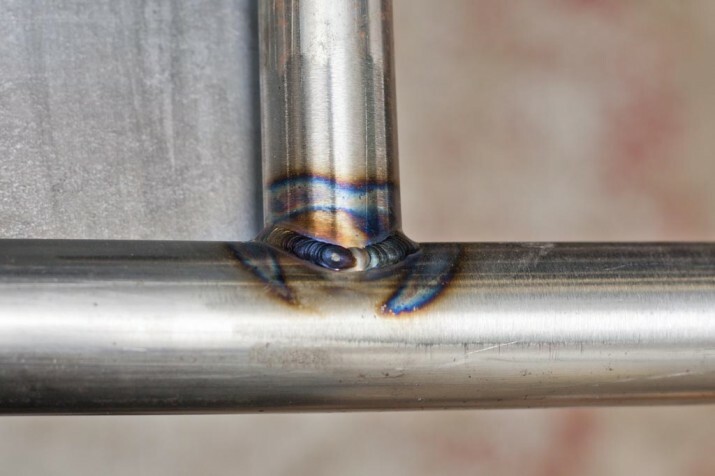 Also notice all tube ends/mating faces are sanded prior to TIG welding, this ensures a high quality structurally sound weld. All joints were wiped down with alcohol prior to welding as well. 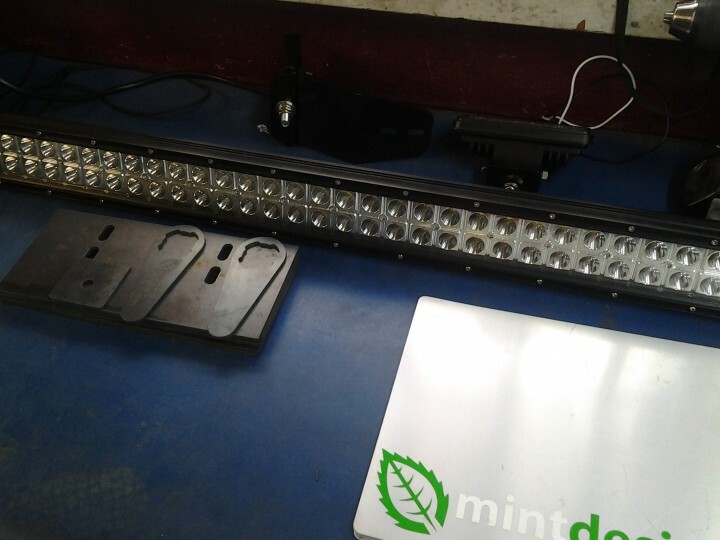 There are a lot of things we can do at Mint Design, some of which we don’t advertise until we have a few projects go through using the new piece of equipment or technique. In this case it’s tube and pipe bending. We will be adding this to our list of services in the near future. 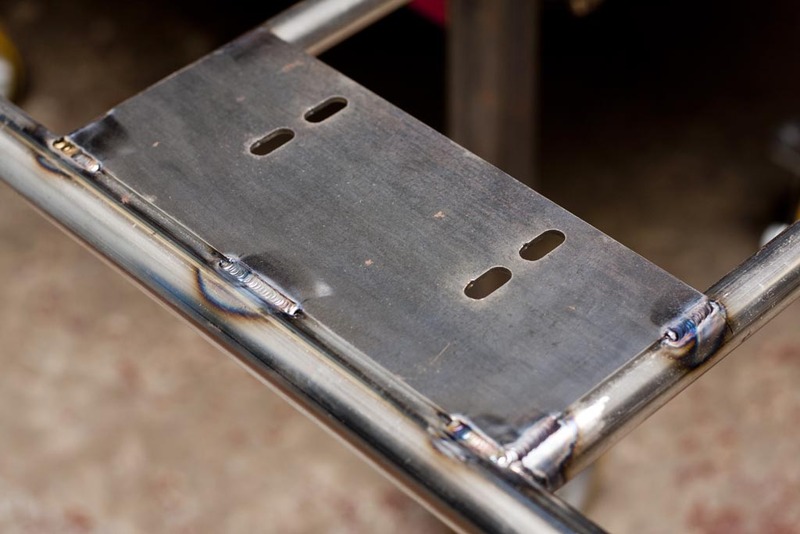 Here are the CNC cut mounting plates TIG welded from the underside of the rack. The nice thing about designing with CAD is that everything just “fits”. There is no slop and everything lines up. The time spent on the computer saves us more time in the shop so in most cases it’s saving the customer money if it’s designed properly from the get go. 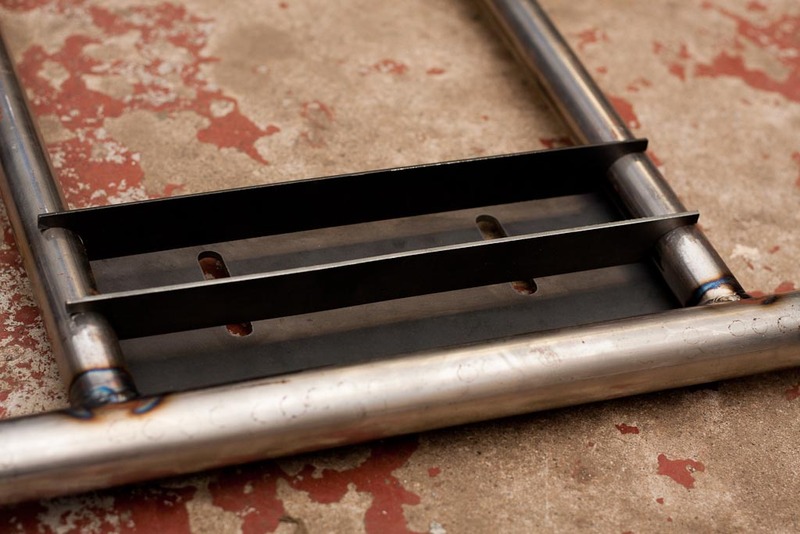 In this case the use of Ø1″ crossbar tubes along with the Ø1-1/4″ perimeter tube is that the 11ga steel plates fit up nearly flush with the outside tube once welded to the Ø1″ crossbars. 100% TIG welded at all the connections. One thing to note, to speed up fabrication as well as improve accuracy and consistency we CNC cut a pair of tubing spacing jigs. This allows us to make sure the rungs are evenly spaced from front to back and from side to side. 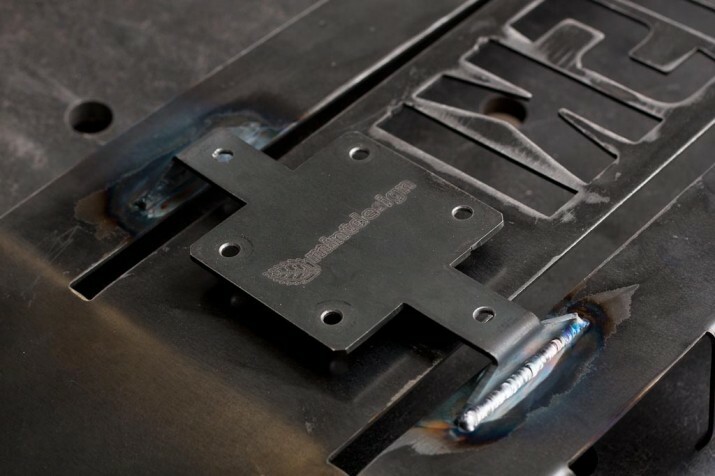 This eliminates any guesswork and makes fabrication work that much easier. Here’s a shot of the super simple jigs. And here is a picture of the finished rack installed. 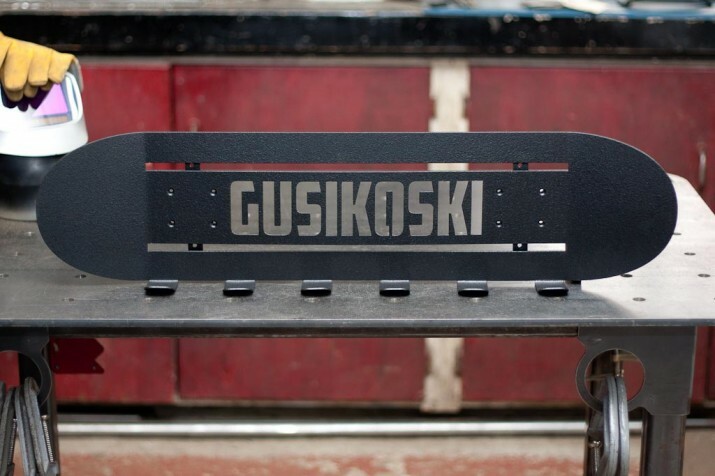 The light bar on the front wasn’t snugged down yet… The customer is going to have the rack powdercoated. 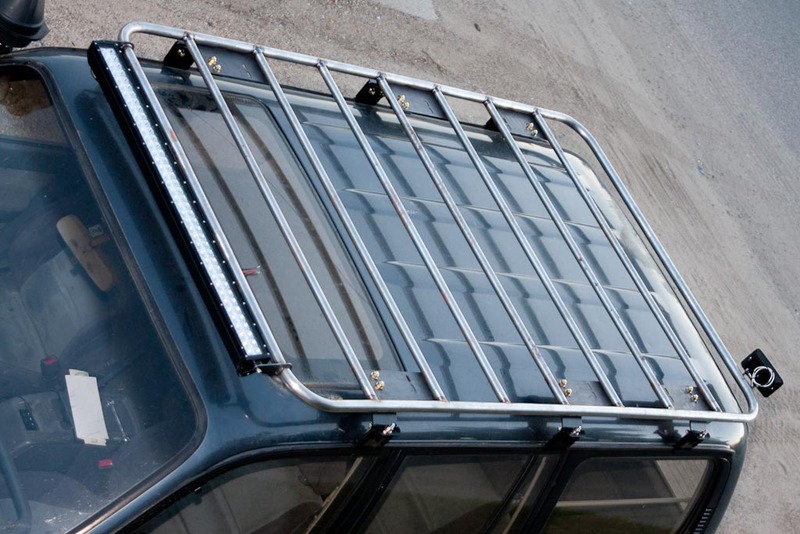 One neat feature about the rack is that it can accept a double set of gutter mounts to distribute any extreme loads evenly across the gutter rail. It’s always fun doing artsy projects that force us to be creative. This is a CNC cut skateboard coat rack that was modeled, CNC cut, fabricated and painted in one day. It’s constructed from 14ga 44W steel with TIG welded hangers on the back. This pushes the deck 1/2″ away from the wall and gives it a 3D look. The long horizontal slots were intentional because the TIG welding process will cause warpage these slots allow for this warpage to be dramatic. This pushes out the text further than the area above and below the top and bottom slots, this giving a greater 3D look. Also after the part was cut we forgot to form the tails on the 3D model, so we formed them after the part was cut. Here’s the rendering before we began cutting any steel. We didn’t get any photos during the cutting and forming process since this was something that had to be done quickly. However here it is prior to paint. The coat rack is based based off a few measurements from this old deck. Since the mounting bracket is viewable from the front, they were necked down along the slots so when viewed from the other side they look like the axles from the trucks. 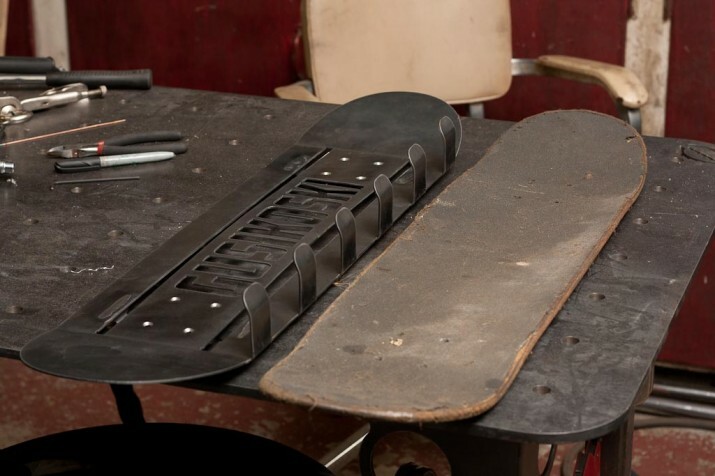 The bolt pattern through the deck and mounting bracket are the same as an actual skateboard so in theory you could bolt up a set of trucks to it. We used a rocker guard paint to finish it off as it’s textured to look like grip tape as well as being really really durable. 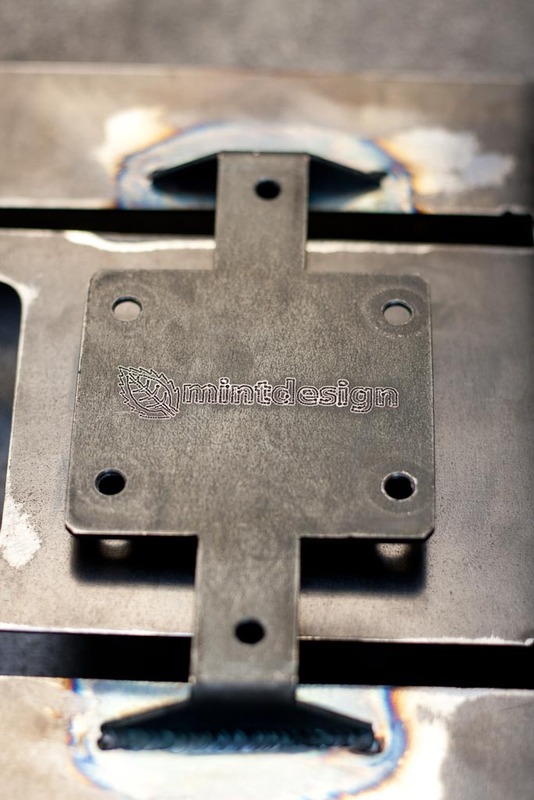 Follow the links to our CNC cutting and welding capability. Thanks for looking! Have a question? Have ideas for a new future project? Please let us know! Copyright © 2013 Mint Design. All rights reserved.